Ключ для активации в Steam. Комплект. Mount & Blade Collection нет региональных ограничений (REGION FREE), и активируется в любой стране! Доступные Языки: английский, французский, немецкий, венгерский, чешский, польский, испанский, турецкий. Для игры на русском языке нужно установить русификаторы. Геймплей открытого типа (в «песочнице»). В этом мире для вас открыты все дороги: вас ждут сотни уникальный локаций, включая деревни, замки и города. Battlerite - Armored Black Bear Mount (region free) 1 р. Heroes of the Storm Mechanospider Mount BATTLE.NET KEY 1 р. Heroes of the Storm - Mechanospider Mount (Reg Free) 1 р.
Mechanospider Mount для Heroes of the Storm (RegFree) 2 р. HEROES OF THE STORM - MECHANOSPIDER Mount| REG. FREE 3 р. HEROES OF THE STORM - MECHANOSPIDER MOUNT (REG.FREE) 3 р. Mount Hill ( Steam Key / Region Free ) GLOBAL 6 р.
Battlerite - Armored Black Bear Mount (DLC) STEAM Key 10 р. Mount & Blade: With Fire and Sword - Набор 5 карточек 15 р.
Battlerite Armored Black Bear Mount Steam Ключ  18 р.
TERA - 30-day Duskwing Mount (NA Region En Masse) 29 р. Mount & Blade - Набор из 10 карточек 30 р.
Battlerite - Razer Serpent Mount (region free) 39 р.
Montague's Mount [Steam Gift/Region Free] 44 р.
Montague's Mount (STEAM GIFT / RU/CIS) 45 р. Mount Wingsuit (STEAM ключ) | Region free 45 р.
Montague's Mount ( Steam Key / Region Free ) GLOBAL 46 р. Mount Your Friends (Steam Gift / RU / CIS) 47 р. Mount Your Friends (Steam Gift/RU+CIS) + ПОДАРОК 47 р. Mount Your Friends (steam gift/ru+cis) 48 р.
Montague's Mount (Steam Key / ROW / Region Free) 52 р. Mount Your Friends (steam gift, russia) 58 р. Mount Your Friends ( Steam Gift | RU+CIS ) 59 р. Mount Your Friends ( STEAM GIFT RU + CIS ) 59 р. Mount & Blade: With Fire & Sword (Ключ - GOG/RegFree) 65 р. Mount Your Friends [Steam Gift] 65 р.
Battlerite Royale Zebra Mount DLC STEAM KEY REGION FREE 85 р. Mount & Blade: Warband (Ключ - GOG/RegFree) 95 р. Mount & Blade: With Fire & Sword (GOG KEY / ROW) 99 р.
Trove - Curse Kami Mount Key / Ключ 99 р.
Battlerite Royale - Moutnain Zebra Mount (Region free) 99 р. Mount Your Friends (Steam Gift | RU) 110 р.
Montague's Mount (Steam Gift/Region Free) 125 р. Mount & Blade: Warband (GOG KEY / ROW / REGION FREE) 129 р. Mount and Blade - STEAM Key - Region Free / GLOBAL 170 р. Mount & Blade: Warband (Steam KEY / ROW / Region Free) 175 р. Mount & Blade - EU / USA (Region Free / Steam) 175 р. Mount & Blade (STEAM KEY / ROW / REGION FREE) 179 р.
Battlerite Razer Serpent Mount Steam Ключ 179 р. Mount & Blade: Warband ✅(Steam/Global)+ПОДАРОК 199 р. Mount & Blade: With Fire & Sword (STEAM KEY / ROW) 199 р. Mount & Blade (STEAM GIFT / RU/CIS) 199 р. Mount & Blade: Warband - Napoleonic Wars (DLC) STEAM 199 р.
Игра для PC Mount and Blade Amasonia 200 р.
BATTLERITE ROYALE: ZEBRA MOUNT 200 р. Mount & Blade: Warband (Steam Ключ) 209 р. Mount & Blade (Steam Gift | RU) 212 р. Mount & Blade: With Fire & Sword (Steam Gift | RU) 212 р. Mount Blade With Fire and Sword Steam RU 214 р. Mount & Blade ( Steam Gift | RU+UA ) 219 р. Mount & Blade: Warband - Napoleonic Wars (Steam|RU+UA) 219 р. Mount & Blade: With Fire & Sword ( Steam Gift | RU+UA ) 219 р. Mount & Blade: Warband (STEAM KEY / ROW) 295 р. Mount & Blade Warband - Steam Gift RU-CIS-UA + АКЦИЯ 299 р. Mount & Blade: Warband (STEAM GIFT / RU/CIS) 299 р. Mount & Blade Warband DLC Collection RU,CIS,UA 319 р. Mount & Blade Warband - Steam Gift Region Free + АКЦИЯ 325 р. Mount & Blade: Warband (Steam GIFT RU/CIS) Tradable 329 р. Mount & Blade Warband (Steam Gift / RU+CIS) + Подарок 339 р. Mount & Blade: Warband - Viking Conquest Steam RU KZ UA CIS 349 р. Mount & Blade: Warband - Viking Conquest RE|Steam|RU+UA 349 р. Mount & Blade: Warband - Viking Conquest RE (DLC) STEAM 349 р. Mount & Blade (Steam | Region Free) 380 р. Mount & Blade: Warband - Napoleonic Wars (Steam | Region Free) 380 р. Mount & Blade: With Fire & Sword (Steam | Region Free) 380 р. Mount & Blade Warband - Steam GIFT / REGION FREE 415 р. 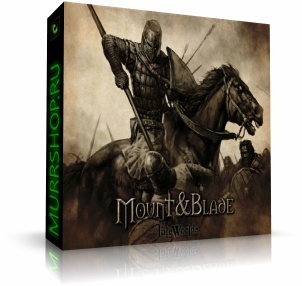 Mount & Blade: Warband (Steam Gift | RU) 467 р. Mount & Blade: Warband ( Steam Gift | RU+UA+KZ ) 489 р. Mount & Blade Full Collection - Steam Key - Region Free 549 р. Mount & Blade Warband (Steam Gift Region Free) 565 р. Mount & Blade: Warband (Steam | Region Free) 577 р. Mount & Blade: Warband - Viking Conquest Reforged Edition (Steam | Region Free) 593 р. Mount & Blade Warband +Viking Conquest +Napoleonic Wars 599 р. Mount & Blade Warband DLC Collection STEAM REGION FREE 680 р. Mount & Blade Full Collection (M&B 1 + Warband + 3 DLC) 699 р. Mount & Blade: Complete (4 in 1) STEAM GIFT / ROW 799 р. Mount & Blade Warband DLC Collection Steam RU KZ UA CIS 961 р. Mount & Blade Warband DLC Collection (Steam | RU+UA+KZ) 989 р. Mount & Blade Full Collection ( Steam Gift | RU+UA ) 1 049 р. Mount & Blade Full Collection (Steam | Region Free) 1 395 р.
Верховая черепаха (Turtle mount - SALTWATER SNAPJAW) 33 249 р.
Большой медведь Blizzard Polar bear mount Blizzcon 2008 88 975 р. 2 Spectral Tiger mounts Спектральные тигры epic & blue 242 660 р.